I wanted walls. 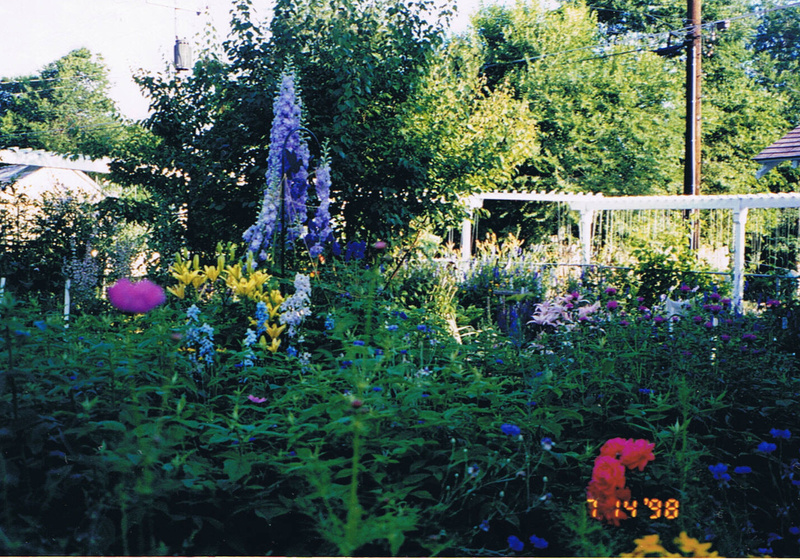 I wanted the serenity of an enclosed garden, the feeling of discovery as you wandered from one "room" to another. I wanted a bit of a secret garden. What we had as we looked at the far back of the yard was a 3 1/2 foot chain link fence that bordered 50 feet across the back yard. Because deer roam the neighborhood, we needed a pretty tall fence but we didn't want a solid fence. That would "wall" us in. Plus we didn't need that wall. We have behind us an alley and behind that a house and yard that has been empty for many years. In the winter after the leaves have fallen , it feels good to be able to sit at our kitchen table and look beyond our yard, sometimes catching a glimpse of the deer that wander behind our lot. As explained in my last post, we were able to make our first garden “room“ by using our house as the east wall. The neighbor’s garage wall as the south wall and our garage wall as the north wall. We hung a divider and made our first garden “room“. One day, probably sitting at a coffee shop, Ted, like he has done many times before, pulled out a paper napkin and sketched the plans for the back arbor that would enclosed the rest of the back yard. Posts set to stand 7 feet high, set every 10 feet in front of the existing chain link fence, capped with an arbor design would surround the rest of the open yard. The arbor runs 100feet in a u shape from the neighbor’s garage wall around to the our garage wall. Next, I strung from the top of the chain link fence to the top of the arbor white poly string for vines to grow on. Amazingly the string has lasted and blends into the background. In later post I will take you around the perimeters of the yard. There are more arbors designed on the backs of napkins to be seen. Ted did a good job on those arbors and it is great the string has held up for so long. I think any deer thinking to jump over that fence would think twice since it is so tall. It looks great. 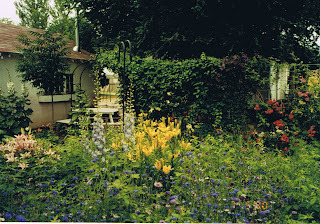 I love all the flowers and the way the garden is simply filled in with plants. Looks fantastic. I'm wondering if you used grape vines only for your draping effect or there are others... The overall look is "veddy" English, well done. Wish I had a hubby as handy with a napkin. I love it, love it , love It! It really does have a secret garden feel. Plans drawn on napkins are the best. Gloria these photos are just beautiful. And, I love the idea of garden rooms! I need more privacy at my place as a new neighbor's house was built too close for comfort. You're giving me lots of great ideas. I just got caught up on your blog, and I just loved seeing what you and your husband have done. It's just beautiful!! The arbors and flowers are amazing. Hi Gloria~~ Well this just proves that inspiration doesn't wait. When it knocks, it's a good idea to answer. Look at the results! I love the balance of structure and lush plantings. I look forward to MORE eye candy. Happy New Year. What fun to see the start of you what has become your masterpiece!! 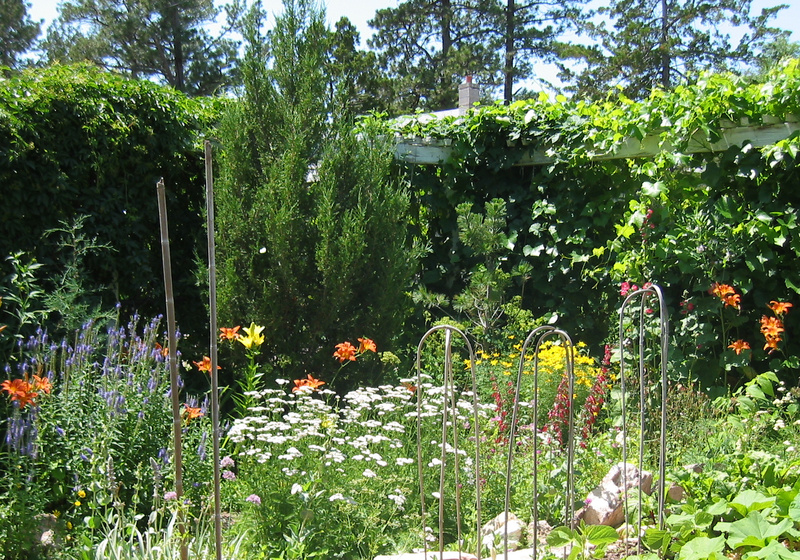 I love the concept and evolution of your gardens. The cottage garden feel and secret rooms are really inspirational! Hi corner kitchen table - thank you! 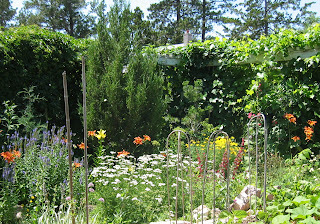 It was fun dreaming up the garden. It's funny how it has changed.